While I appreciate the hagiographic salute, I think it's important to remember that it's a seemingly universal aspect of humanity to follow one's inspiration in sometimes a seemingly obsessive way. My friends and I were inspired to try the ridiculous when young (and now!) before we ever heard of the exploits of other climbers (perhaps like the stories one hears of Native American kids spanking bears then running away madly, or stealing horses simply for the thrill of it). What I most like about Gill is that he is able to talk about climbing in an intelligent artistic way. In response to the first anonymous comment, there is nothing hagiographical about the post, though if any climber merited such treatment it is probably Gill. Instead I am arguing for the profoundly historically important impact of this ascent, which was not done on the spur of the moment. The Thimble climb was a carefully calculated free climb of a sort that had simply never been done before. While it may not be unheard of I wouldn't agree that it is a 'universal aspect of humanity to follow one's inspiration in sometimes a seemingly obsessive way.' Universal, as in everyone does it? I would say relatively few people do, but for me this is really not the key point. For me the true wizardry of Gill lies in the way he truly freed himself of what he 'thought' he could do and just tried to do whatever he could. For me and many others the fact that others are doing something makes a huge difference in believing I can do it. Gill was able to transcend that for the most part and set a whole new standard. Not many humans do that in any field. While he was not alone in this trait, it is precisely the way that Gill pursued his own limits with so little competition or co-conspirators that makes his achievements extraordinary to me. Of course his articulate and intelligent manner and fairly unique perspective on climbing are wonderful attributes as well. I spent today alone in the Flatirons and along the way I was thinking about Jim Holloway and the way he, too pursued his own wild goals up there in isolation. Cheers on the 50th anniversary, John! 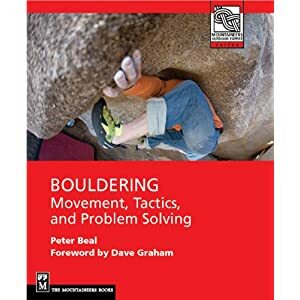 I only had the privilege to go bouldering once with John Gill, about 25 years ago in Pueblo, not too long after his "re-discovery" by Bachar and Long. In person his low-key humility and humor reveal nothing of the drive and vision to invent a sport. The entirely different climbing community today, that supports exploration, standards-pushing, etc. not only financially but socially and philosophically, creates a nurturing climate of behavior reinforcement (not always in a good way). Sponsorships and structured worldwide competitions give instant gratification and reward talent so young pros can train and travel full-time. 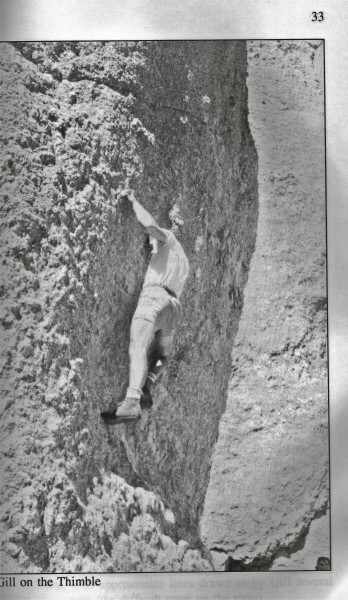 Gill literally created the sport in a vacuum - no one within 3 number grades of him, not once, but over and over, seemingly miraculously creating gardens of rock wherever he went, from southern Alabama and Illinois sandstone to Devil' Lake quartzite, Blacktail Butte limestone, and granite from Vedauwoo to Estes Park, the Tetons, and the Shawangunks, and penultimately Horsetooth and Pueblo, all incidental to his advancing professional education and math career! Most climbers likely wouldn't even think to look for Little Owl Canyon in its unlikely direction from town. Try climbing anything technical in old RDs with their hard, slippery soles, then imagine being 30 feet up on shiny, sloping crystals, no spotter, pads, but a back-breaking log railing below. My February trip to Pueblo with Neal Kaptain revealed the difference between getting up a problem, and doing it in Gill style. We toproped a technical double dyno that involved a body rotation and landing a sloper above a bulge that hit your chest and pushed you off unless you arched your back to clear it. Neal had recently done the double dyno on Flagstaff's Beer Barrel, but couldn't get within 18" of Gill's problem. Gill did it once, but wasn't satisfied until he repeated it with just 6" of swing at the moment of contact. He was already adding style points to things most would be happy to just send.